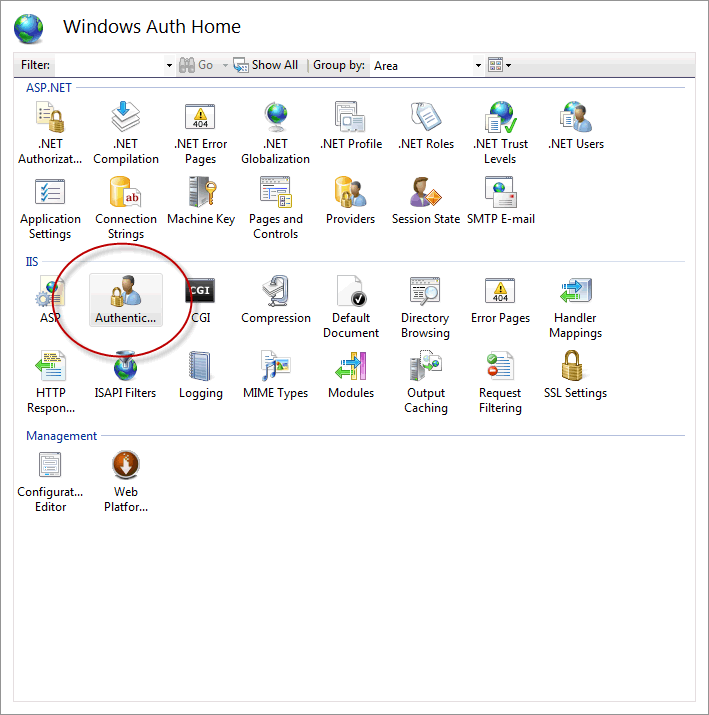 Integrated Windows Authentication is the preferred approach to authentication whenever users are part of the same Windows domain as the server. Users are authenticated against an existing identity store such as Active Directory, and their credentials are not transmistted across the Internet. In addition, users are provided with a seamless experience, as they only need to log in to Windows, and their browser and IIS take care of managing authentication from then on. There are a number of alternatives to Integrated Windows Authentication: Basic, Digest and Client Certificate, but only Integrated Windows Authentication provides strong authentication without the hassle of managing client certificates. It is therefore the recommended option. There are three items to note: first, an appSettings entry is added to turn off SimpleMembership, which relies on Forms Authentication. Then, within the system.web node, the authentication mode is set to Windows. 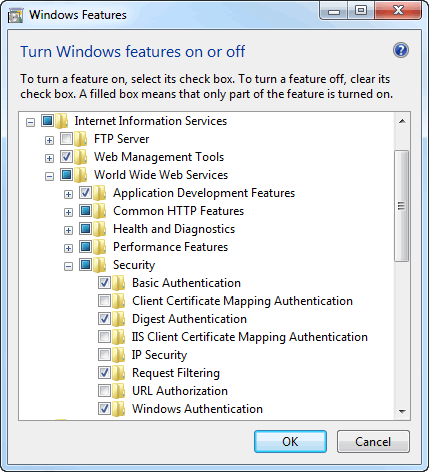 When you deploy the site to the full version of IIS, you can use the standard IIS administrative tools to manage configuration. 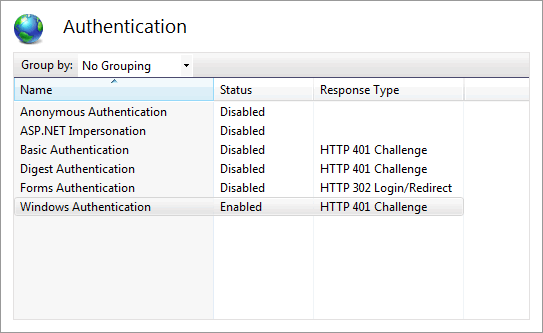 First, you need to ensure that Windows Authentication is enabled for the web server. You can do this by going to Control Panel » Programs and Features, and then clicking Turn Windows features on or off (left hand side). Locate Internet Information Services and then drill down to Security and ensure that Windows Authentication is checked. 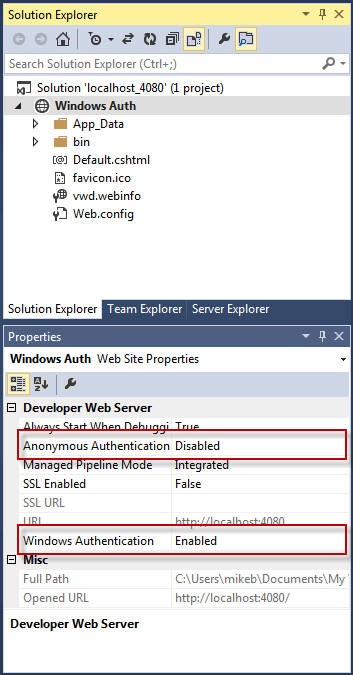 Make sure that the options are the same as you set in IIS Express: Anonymous Authentication should be disabled, and Windows Authentication enabled. Users are logged in automatically and their identity is stored in the Identity property of the User object. The User object is an instance of the IPrincipal interface. The underlying type is the WindowsPrinciple class. You can get the name of the user from User.Identity.Name. The value returned from this is in the form DomainName\UserName or MachineName\UserName. For example, if I have a Windows login for a domain called CONTOSO01, the value returned by User.Identity.Name might be CONTOSO01\mikebrind. Note that you also need to add a using directive to reference the System.Security.Principal namespace. Enumerations are good, in that Intellisense offers code completion and compile time checking, but you can't use this approach to test for membership of custom groups that you have created such as the Sales one illustrated earlier. Unless you actually need to use this method, there seems little point in activating the RoleManager for your intranet site.